Yesterday the folks from Space Island came to Google to give a presentation. These folks are raising money to build space stations, using shuttle external fuel tanks. 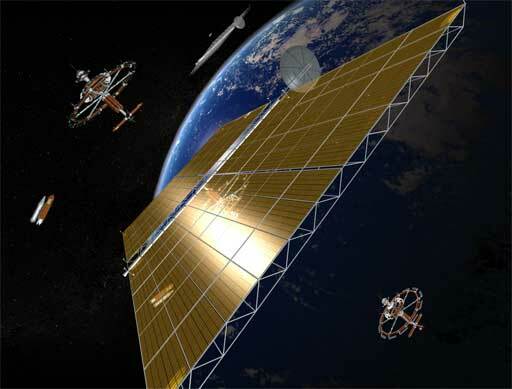 They plan to rent space in the stations to manufacturers, researchers, and tourists, and to build solar power satellites, and other orbital construction. The presentations were much too slick for the tech-heavy Google crowd, making the project seem more like Disneyland meets Las Vegas than a serious space program, but the question-and-answer period quickly got down to hard science and economics as people asked about safety issues, solid rocket booster exhaust, timeframes, and costs. There were good answers for all of the questions, and if they can actually raise the $5-7 billion they want, it looks like they can probably do it, and maybe even make money at it. Some parts of the plan were less convincing than others. Snagging near earth asteroids for building material sounds like something I wouldn’t want to bet a company on. But that was not presented as a necessary part of the business plan, just something that would be a nice benefit later. The weather control ideas sound a little dangerous. The Mars mission is a long shot. The economics of solar power satellites have interested China and India, where getting power to rural locations is difficult and expensive. But where access to the grid is available, ground based solar arrays might be more economically sound, even though they only produce power 8 hours out of 24 on clear days. It seemed to some in the audience that putting up a lightweight mirror would be cheaper, and putting the heavy solar panels in Arizona or central Australia where clouds are not an issue would make more sense. Their schedule is certainly intriguing. They hope to have the first modules in space in five years or less.